The environmental protection must be checked when commodity concrete mixing station is completed, is also a basic requirement of the mixing station construction of civilization. The environmental protection standard of concrete mixing station mainly refers to effectively control dust, waste water, noise, solid waste. Commercial concrete mixing plant waste water treatment: Set waste water drain in the place of the produced, and settling basin in the drain terminal. To use the water after precipitation. Commercial mixing plant dust control: dust generating place mainly refers to dog-house and yard. Outside the cement feeding mouth add two symmetrical water injection pipe, prevent the spread of dust.Yard dust according to the fixed position of site, set up electronic or manual spray device, to control dust. Solid waste management: reasonably handle concrete mixing station in the production and life of non-recyclable waste and life rubbish. CamelWay Machinery sales concrete mixer, concrete batching plant, concrete batcher, concrete conveying equipment, bulk cement, concrete mixer truck, hydraulic concrete mixing transporter and screw pump, etc. 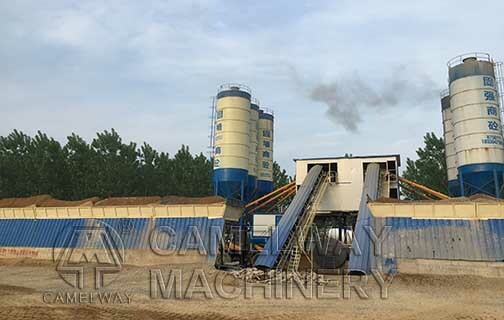 If you want to buy any equipment about concrete batching plant, please contact us!